The meeting was part of the official visit by French Prime Minister Édouard Philippe to Vietnam from November 2 – 4. In his welcoming remarks, Chung gave his guests an overview of Hanoi’s advantages and potential as well as promising areas for cooperation between the two sides. 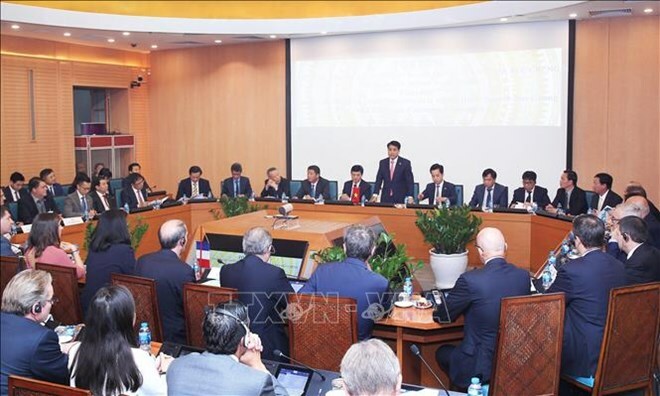 He said Hanoi is a fast-growing city and ideal destination for investment, adding the capital city posted an annual economic growth of over 8 percent and currently leads Vietnam in Foreign Direct Investment (FDI) inflow, accounting for 22 percent of the country’s total FDI. As of October this year, France had operated 102 FDI projects with a total registered capital of 273.6 million USD in Hanoi, mostly in manufacturing, construction services, trade, real estate, finance and banking. France has also provided the city with 515.39 million EUR (586.96 million USD) in funding for three other projects. Notably, Hanoi has set up close ties with France’s Ile-de-France region and Toulouse city in the fields of culture, tourism, healthcare personnel training and most recently, urban metro rail system. The cooperation has strengthened mutual understanding and expanded trade relations between Hanoi and French cities. The official further said Hanoi expects more French investment in transport infrastructure development, education, healthcare and culture; and hopes to cooperate with French businesses to develop the capital city towards a smart city by 2025, with a vision to 2030. The city’s poor infrastructure and noise pollution have challenged the development of local freight transport,so Chung wants the French firms to join the city in addressing these issues. At the same time, the city’s treatment of 95 percent of daily waste with the use of old technology is causing a big risk for the city, he said, calling for French investors to bring advanced technology to this work of the city. Chairman Chung and French representatives later witnessed the signing of a Memorandum of Understanding on a joint survey and feasibility study for construction of an international wholesale market for agricultural products between the Hanoi Department of Industry and Trade, Vietnam’s VinGroup and France’s Semmaris Group./.